I’m afraid it’s a quick post from me as I’m playing tour guide to my parents this week! 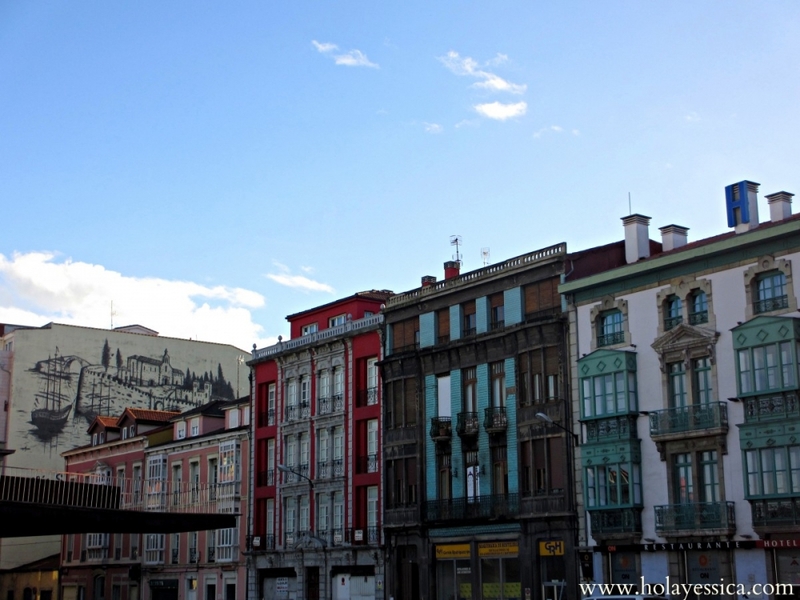 Here’s my regular Wednesday post from Avilés, Asturias. These pretty little houses were facing the river, on the opposite side of the bank from the very fancy Cultural Center (so fancy that even Brad Pitt had a hand in creating it!) I love the different-colored buildings with their little balconies poking out to get a glimpse of the winding river. I’m not sure what the painting at the end is for, but I do know that similar paintings in Barcelona were done if your neighbor suddenly decided to build quite a bit higher. You lost your view, but to compensate, some places gave you a painting of the river so you didn’t entirely miss out on seeing the water. I’m not sure if that’s the case here too, but it’s a funny way to make up for it! P.S. On the topic of Asturias, a special thanks to the team from Paradores de España, who offered me a very cool opportunity in Asturias. I wasn’t able to make it this time, but I hope I can in the future! Look up the paradores if you want somewhere beautiful and a bit different to stay in Spain. Looks great, Jess – that’s another place to put on my list! Excellent! 🙂 If you’re in Asturias, this is a really cute little place to visit. Woww, I just Google Image-d that and it looks incredible! Can you go up to the terrace as a visitor? I wasn’t able to make it to the Paradores trip either – would have been great to meet you! And I love that today you’re featuring Avilés: I start the Camino from there next month! Ahh that’s a shame! I guess playing tour guide to parents isn’t a bad alternative though, right? 🙂 Hope you’re having fun with your mom, and good luck on the Camino next month. I try the Parador of Aiguablava (Costa Brava), and I’ll talk about it soon in my blog. The view from its terraces is just GREAT! Nice post, would love to visit Asturias! I can’t wait to hear about it on your blog! I’d love to go to a parador soon, they look incredible. Stayed in Aviles for a night and find it surprisingly charming! Enjoy playing tour guide with tus padres! Gracias! They’re loving Spain so far. Charming is a great word to describe Avilés. It’s so cute! Hello. I hope you enjoyed your stay at Avilés. That painting is for the river you saw, as it was at the Middle Ages. It’s still there as you can see in the link above, and there lies the corpse of Pedro Menéndez de Avilés, founder of Saint Agustine (Florida) in 1565, the oldest continuously inhabited European-established settlement in the continental United States. As you can see, there are more things than Niemeyer Center in Avilés. I really liked Avilés, and thanks for sharing the story of the painting. Do you know why they chose that building to put it on? I did visit the Iglesia de los Padres Franciscanos, but I’m afraid I only saw the outside. The city is really beautiful, and you’re right – the Niemeyer Center is just one part of it. As far as I know there was no special reason for painting that building. Just for the pleasure of beauty (‘por amor al arte’, que se dice en español). It’s a good initiative, and I know it’s not the only building with this kind of paintings in Avilés, but maybe this one is the most beautiful. Not all avilesinos like the transformation. I’m one of them, but take your own conclusions. Oh that’s so cool! I actually quite like the transformation. Avilés is a Great Place. When you are arriving by road it may seem like a modern, industrial and gray city, but it has one of the best “cascos antiguos” (not pretty sure how it is call on English) of Asturias. It’s a really nice place to spend the day.